Who is MoProAuto, and how long have you been in business? MoPro, LLC specializes in mobile automotive restyling and reconditioning services in areas throughout the United States. We offer auto dealerships and retail customers alike superior automotive products in the areas of pin striping, vinyl graphics, rear spoilers, body side moldings, and other popular auto accessories. We are also a leader in auto interior reconditioning, including leather, vinyl, fabric and carpet repair and dye. We began installing factory OEM and aftermarket auto accessories close to 30 years ago, and we are still going strong! With our experience in the auto accessory business, we can help you make the right choice when it comes to purchasing an accessory for your vehicle. MoProAuto.com is our professional online store that offers a variety of aftermarket supplies and specializing in brand name automotive graphics and decals by the most trusted manufacturers in the industry, for cars, trucks, SUV's, and much more! MoProAuto offers a huge stock of vinyl graphics for just about every make and model. From domestics like Ford, Dodge and Chevy, or imports from Honda, Toyota, or Volkswagon, MoProAuto has the auto accessories to add to the style of your ride! From our wide variety of vinyl graphics, we only offer professional grade vinyl from the leaders in the industry. Don't settle for less, you can find the best products and value right here! MoProAuto.com and MoProAuto.net started by offering vinyl graphics, decals and stripe kits Pontiac, Chevrolet, Chevy, Ford, Dodge, Chrysler, Toyota, Nissan, Hyundai, Kia, Honda, Jeep, Buick, Volkswagen and GMC as factory style OEM decal kits. Models included Chevy Camaro 2016-2018, Chevy Camaro 2014-2015, Chevy Camaro 2010-2013, Chevy Cobalt 2005-2010, Chevy Corvette 2010-2018, Chevy Cruze 2011-2014, Chevy Silverado 2000-2018, Chevy Sonic 2012-2014, Chevy Spark 2013-2014, Dodge Avenger 2008-2014, Dodge Challenger 2008-2018, Dodge Charger 2006-2018, Dodge Dart 2013-2016, Dodge Nitro 2007-2011, Dodge RAM 2009-2018, Fiat 500 2010-2014, Ford F-Series 2009-2018, Ford Fiesta 2008-2013, Ford Focus 2005-2014, Ford Fusion 2013-2018, Ford Mustang 2005-2018, GMC Sierra 2000-18, Hyundai Veloster 2011-2018, Kia Soul 2010-2018, Mini Cooper 2010-2014, Pontiac G5 2005-2009, Trans Am 1978-1983, Toyota Tundra 2007-2014, Volkswagen VW Beetle 2000-2014. General Motors Chevy GM models or divisions we first offered included 2010 Camaro, Z28, Super Sport, SS, Rally Sport, RS and Indy 500 and Nascar Pace Car door OEM style factory style decals stripes and graphics. Thse are also known as car decals and graphics, car decal stickers, car decals; these automotive vinyl decals, vinyl decal kit, or vinyl graphic decal and vinyl stripes kit are for cars trucks vans automobiles and the automotive restyler restyling industry. While these factory style kits were also called auto graphics, vehicle graphics, car decals, four wheel drive 4x4 decals and stripes, car stickers, decal kits, emblems, vinyl decals, auto decals and graphics; the typical term remains automobile factory style and universal fit decal, graphics and stripe kits. GM decals are General Motors Decals and remain strong sellers for Camaro SS decals, Camaro Graphics, Camaro SS Stripes, Camaro Racing Stripes and Camaro stripe kits or GM restoration vinyl parts. Restoration decals simulate an oem style stripe, oem style decals. They bring a factory OEM style without the dealer parts department price! While Mopar parts, Dodge, Dodge RAM or Dakota Truck, Jeep and factory style Ford stripe and decal kits were needed in the market we approached these soon after. Vehicle specific decals, decal graphics and decal stickers are all in the sights of our production facility. We began with the most popular models including Chevy Camaro, Chevy Cobalt, Chevy Corvette, Chevy Cruze, Chevy Silverado, Chevy Sonic, Chevy Spark, Dodge Avenger, Dodge Challenger, Dodge Charger, Dodge Dart, Dodge Nitro, Dodge RAM, Fiat 500, Ford F-Series, Ford Fiesta, Ford Focus, Ford Fusion, Ford Mustang, GMC Sierra, Hyundai Veloster, Kia Soul, Mini Cooper, Pontiac G5, Trans Am, Toyota Tundra,Volkswagen VW Beetle, Charger R/T, Super Bee, Challenger R/T, Magnum GT, Chrysler 300, Dodge Ram 1500 Truck stripes, Rumble Bee and Custom decals. Car emblems or auto emblems are produced with GM emblems, Dodge emblems, Mopar emblems, Jeep Emblems, Ford emblems and Truck emblems to help with market demand for such items for our customers. As car and autmotive decal kits, auto stripe kits, stickers, custom stripes, custom decals, they all remain popular terms for decals for muscle cars. These muscle car stripes kits for GM, Chevy, Ford, Dodge and mopar auto stripes are sometimes sold with other popular models. Dodge Decals and Dodge stripes in vinyl stickers format. Often mopar stripes, mopar decals and mopar stripe kit are used as terminology for the above stickers. Please browse what we have to offer for these popular factory OEM styles! Why should I purchase my vinyl graphics from MoProAuto? Our Professional "Cast" Vinyl by 3M, Avery, and Ritrama will outlast the cheap "calendered" vinyl used by others in the industry. Our vinyl is Automotive Grade and OEM approved. For our "vehicle specific" kits, our design team precisly measures the actual make/model/year for each vinyl design, to achieve the most accurate fitment available! We sell direct to automotive dealerships and professional restylers across the country. Chances are if you have seen one of these graphics at your local car dealer, they are the MoProAuto Pro Design Series vinyl kit. We have outstanding pricing compared with the same OEM vinyl graphics you would purchase from a dealer parts department. Why pay hundreds of dollars more for the same quality? We also offer a wide range of "universal fit" vinyl graphics, with 1000's of styles to choose from! Simply put, we have professional automotive vinyl graphic, decal, and striping accessories from leaders in the industry at unbeatable prices, and get them to you fast! We offer new products on an almost daily schedule! We have a large catalog of products to add and our product department has new designs coming out weekly! So check back as often as you'd like. How often do you have sale prices? If you see special banners in our online store, it's time for special sale items! We may have overstocks or clearance items, and we are passing the discounts on to you! Look for them weekly, monthly, or maybe yearly, but they are coming when you least expect it! Some retailers and internet stores have inventory that has sat in warehouses for years, and there is a shelve life for vinyl graphics. We keep a fresh supply of vinyl available, and most are printed to order. So you get the newest items, with the fastest shipping, at the best price we pass along to you. Ask yourself, is the item from a trusted source? Do they have years of experience in the industry? Is it even new? Email us the link if you do find a better price you trust, and we may even beat the price, plus a 10% discount! Ask us about our "Best Price Promise!" Can I call you? I want to talk to you in person . . .
Because we offer most of our products at deep discounts, and in an effort to keep our prices as low as possible, we do not have a dedicated staff for telephone ordering or telephone customer service. Modern technology allows you to purchase our complete line of products on our website. We also answer any question, comment, and concern through our website and through email. We are able to answer most emails in the order they are received, always within 24 hrs! This helps us to continue to offer our products and especially our MoProAuto Pro Design Series vinyl graphics at prices you can be happy with! It is our goal to personally answer each emailed question, comment or concern we receive, so please CONTACT US! and we will get back with you! Must I make an account to purchase? Because I'm ready to BUY NOW! No not really. We know, making an account is a pain, so you have the option not to make an account if you want to check out quick! If you would like to make an account to keep track of your current or future purchases, please do! Either way we are here to serve you! What else can you tell me about vinyl graphics or rear spoilers? We understand you might have more questions about our products, especially on installation. Follow the information *AT THIS LINK* for up to date information, and be sure to completely read the description on the items page for complete details! What is the QUALITY and TYPE of vinyl you offer for the MoProAuto Pro Design Series graphics? We use only Professional Automotive Grade Cast Vinyl by these American manufacturers : 3M, Avery, Ritrama. These vinyl films are "Cast" 2mil (50 micron) thick. These vinyls can have an expected lifetime durability rating of five to eight years or more if well taken care of by the end user. The vinyl films we use are the highest quality, longest durabilty vinyl films available for automotive use, and the same quality vinyl films used by many OEM Factory vinyl graphic kits. Please see the links below for more information about these vinyl manufacturers. Why are vinyl colors shown only a "simulation" of the actual vinyl color? Can I purchase a COLOR CHART with actual samples of the vinyl? Due to individual variations in monitor color settings, colors may not be accurately represented to you in our online color chart pictures. The colors shown are a representation of the actual vinyl color to be used as a reference only. Online color charts are for reference only. What is the THICKNESS of the vinyl offered? Today many professional 3M, Avery, and Ritrama vinyls are all 2 mil (50 micron) thick, and our most popular is 3M Scotchcal Automotive Performance Grade Vinyl. The vinyl is 2 mil thick and is the same quality and thickness that conforms to OEM standards. "Thicker" vinyl attracts dirt and wax around the edges of the vinyl, and will lessen the life of vinyl graphics on your vehicle. The 2 mil thickness is best at conforming to the complex curves of many vehicles, best at avoiding dirt build up on edges, and best at preventing premature peeling. Professionals recommend this vinyl thickness for modern automotive applications. 2 mil. thick vinyl is the same quality and thickness that conforms to OEM standards. "Thicker" vinyl attracts dirt and wax buildup around the edges of the vinyl, and will lessen the life of vinyl graphics on your vehicle. The 2 mil thickness is best at conforming to the complex curves of many vehicles. The 2 mil thickness is best at avoiding dirt build up on edges, and best at preventing premature peeling. "VERY AWESOME job you guys do on your vinyl kits. I just need to comment on the thickness of the vinyl . . it is an absolute JOY to work with! I've tried other vinyl brands, some 3 mil to 5 mil thick, and they are a BEAST to work with and smooth out correctly! Ever tried to install a thick vinyl graphic on the hood of a 2013 Camaro? It's next to IMPOSSIBLE! The 2 mil thickness of the vinyl you guys use is spot on, and made the Camaro racing stripe install go without a hitch. I just followed the installation instructions exactly and had no problems. Keep up the good work guys!" Professionals recommend 2 mil vinyl thickness for modern automotive applications. Wouldn't a THICKER vinyl be more durable? It most cases, this is not true! It may make sense that thicker material could be more durable, but an understanding of how vinyl graphics are produced and installed is needed. The thicker vinyl graphics films (3 mil and thicker), are usually "calendared" vinyl films which are produced by extruding the material through rollers to make them into a usable film. Having gone through the extrusion process they are susceptible to shrinking and cracking because they are trying to return to their pre-extruded state. Calendared vinyl films have durability ratings below 5 years, because they are mostly used for indoor or outdoor signage applications not meant to last long or be used in automotive applications. Thinner vinyl graphic films (usually 2 mil), are usually cast vinyl films which are produced by casting the vinyl on the casting sheet in a relaxed state which offers very good dimensional stability. This process also allows the film to be very thin, which helps with conformability to the automotive application surface. Material manufacturers such as 3M, Avery, and Ritrama recommend the use of cast films on substrates such as fleets, vehicles, recreational vehicles or boats where the customer wants a "paint-like" finish that will last usually five - eight years or longer. For more information about the vinyl we use, please see "About Our Premium Vinyl" AT THIS LINK. What types of vehicles can these vinyl graphics be installed on? However, our "UNIVERSAL FIT" vinyl graphics can be applied to any flat smooth surface of: steel, aluminum, brass, wood, cardboard, magnetic film, foam core, plastic, chloroplasts, and glass. And of course the side of your car, truck, van, SUV, trailer, etc. These graphics can be installed on more than automobile & truck applications; doors, window displays, guitars cases, golf carts, pools, motorcycles and boats! Can you make a CUSTOM ORDER? You don't have a style I need . . .
At this time we do not make custom orders, due to design costs of each kit and the availability of the make/model/year of the vehicle in question. All design options, colors, etc., will be mentioned in the listing. If it is not mentioned, then we are not able to customize the order. The reason customized orders are not available is that we must have the exact vehicle in our shop to get proper measurements to produce a precise vinyl graphic. We do not "guess" at the proper fitment of our vinyl graphic kits. So if you have an older model vehicle but want one of our newer designs, 99 percent of the time the exact make / model / year is not available as reference for us to produce a kit for you. However, we are constantly adding new products and do have access to 1000's of different graphic styles and accessories. If it’s not on our site, we may be adding it soon! So please check www.moproauto.com for regular updates! WE DO NOT OFFER STENCIL, PLOTTER FILES, PATTERNS or SOFTWARE : MoProAuto does not offer the means for a 3rd Party to reproduce the kits we sell. All kits and pictures on our website are protected against unauthorized reproduction. Do I get both sides of the vinyl graphic? Yes! If a picture shows just one side of a vehicle, you will get both the driver and passenger sides of the kit. The specifics of each kit will be listed, and kits come as shown in the pictures. Please read the description of the item for complete details. Are vinyl graphics easy to install? Yes! Most kits have been designed to be installed by one person in about 20 to 30 minutes. "VEHCILE SPECIFIC" vinyl graphics, or larger "UNIVERSAL FIT" vinyl graphics will take longer and may involve more than one person. If you do not have experience, please do as much research as possible on how to install vinyl graphics, or find a qualified professional in your area. If you have any questions about installation, please contact us! What installation tools will I need if I decide to install myself? A stiff plastic squeegee and a sharp razor knife. You may wish to make a wetting solution–one drop of dish soap to one quart of water–so you can lift the kit back up during installation to remove large air bubbles or just to make adjustments as needed. Use a clean spray bottle but don't use too much soap, one drop per quart is plenty. Some pro installers like to install kits dry since there is no drying time before you can remove the premask, and they have the experience needed to avoid air bubbles and placement problems. It is recommended that you do a wet installation on kits 40" and larger. The smaller 'mini' kits should be installed dry. Do vinyl graphics damage the paint job? Not at all! 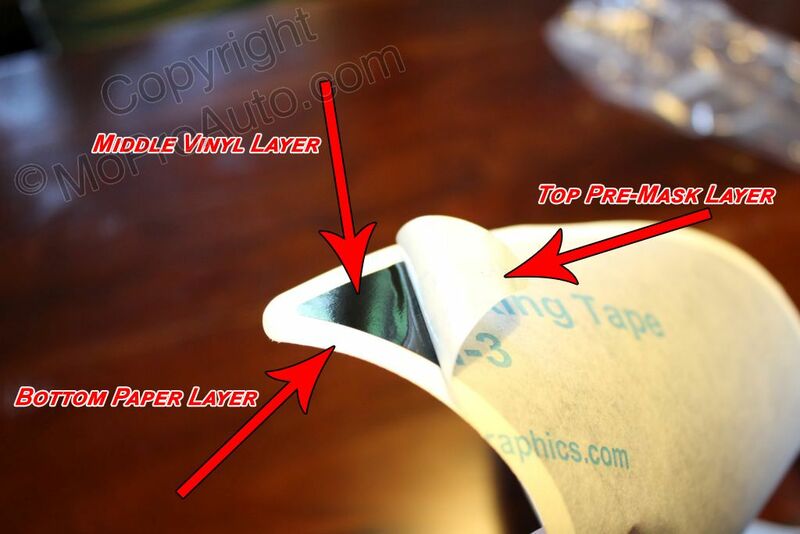 Professional Automotive Vinyl films today are designed to be removed if desired. We have customers who change their kits often for a new look, and have no problem removing the kit. Please email us for details on how to remove vinyl graphics. Can vinyl graphics be removed, or are they permanent? Yes, vinyl graphic kits can easily be removed within the first year, but after that you may need to heat them up with a blow dryer (not a heat gun) to make it easier to remove them. The graphics are considered permanent since they are manufactured and tested to last for years in normal outdoor elements but can be removed at any time. Can I move the vinyl graphic to a different position after installation? Kits can be repositioned during installation if installed wet, but they can not be re-used once they have been installed! So please do your best a correct placement the first time! That's why the instructions suggest that you do a "dry fit" first. Place the entire unopened kit on the vehicle with some masking tape to hold in place, and move it around until you are happy with the position. Then make reference points for the corners of the kit with masking tape on the car. When you remove the kit and begin the installation, you can place the kit back on your corner marks to make sure it's exactly where you want it. Can the vinyl be cut into smaller sections and re-arrange them on the vehicle? "VEHICLE SPECIFIC" vinyl graphics are made to fit the Make / Model / Year specified, and little to no trimming is required to re-arrange or customize the kit for installation. However, some "UNIVERSAL FIT" graphic kits have been specifically designed in several pieces, even though it ships as a two-piece graphic kit with a left and a right side. Each side of the kit is designed to look good when installed as a one-piece graphic, but you have the added option of re-arranging the pieces to change the look of the kit. Each side might have several smaller pieces that can be carefully cut away from the main kit and installed separately, allowing you to create a one-of-a-kind design to fit the vehicle. Kits from Auto Trim Express, Illusions GFX, and FAS Graphics (just to name a few) are able to have multiple options for installation. Can I install more than one vinyl graphic? Absolutely! Many customers purchasing "VEHICLE SPECIFIC" vinyl graphics will add more than one style to set their vehicles apart from the rest! With "UNVERSAL FIT" designs, you may want to cover a larger area. You can try one of the larger kits shown in the catalog. Sometimes two or more kits can be used on large trucks or conversion vans, but the most common graphics that are applied two or three times are flame kits. The front end of a vehicle can be covered for a full custom flame job. Other kits that can be doubled up are Shredder which is made of separate sections that can be re-arranged as a larger group, and the Hydro for a heavy splash effect. Your designs are only limited by your imagination! Can I have a professional install the vinyl graphic for me? Yes! Since you only get one chance to do it right, many people choose professional installation as an option. There are thousands of professional graphics installers located in the United States and around the world! In your area, local sign shops dealing with vinyl and restyling shops would be happy to help you with installation for a small fee. You can also contact us for help finding a professional installer. FIND A 3M CERTIFIED INSTALLER: We would recommend only using a 3M certified and/or Avery professionally trained vinyl graphics installer. Please CONTACT US! with the subject line "NEED PROFESSIONAL INSTALLER" for help. What is the best way to install vinyl graphics or any other item from your website? We understand you might have more questions about our products, especially on installation. Follow the information *AT THIS LINK* for up to date information, installation instructions, videos, etc. Also be sure to completely read the desciption on the items page for complete details! After installation, what is the best way to care for and clean vinyl? Are there enviromental issues to take into consideration? Avoid waxes with a petroleum base, which will have a negative impact on the vinyl. Avoid automated car washes, or only use "touchless" car washes. Store the vehicle in an enclosed area when possible. The environment can have an effect on the vinyl, just as you need to care for vehicle paint, tires, and other exterior and interior maintenance on your vehicle. HELP! How can I avoid pulling the vinyl back up when I remove the pre-mask? The pre-mask is a clear layer on top of the kit which allows the kit to keep its shape when you place it on a vehicle, and in most cases allows you to "see" what the graphic will look like on your vehicle. When you begin installation you will apply even pressure with a squeegee onto the vehicle, right through the pre-mask layer. When the graphic is evenly placed on the vehicle, you will remove the pre-mask. Please wait at least 15 minutes before removing the pre-mask layer if you have used a "wet" installation method. When begin to remove the pre-mask, PULL SLOWLY! Pull evenly and slowly at a 45 degree angle to avoid lifting the kit. HELP! The paper is sticking to the vinyl! The paper backing getting wet during installation is the only reason the vinyl will "stick" to the paper. From the time of production until shipping, there is no way the graphics kit comes in contact with any type of moisture, unless the package is left in wet weather upon delivery. Again this issue is discussed in the "Vinyl Graphics Disclaimer" and also "General Installation Instructions" that should have been read before installation began. One trick that professionals use when this happens is to soak the pieces stuck to the vinyl with soapy water and try to gently scrape the paper from the vinyl, and the graphic can still be used. However we do not guarantee this will work. HELP! How can I remove small bubbles in the finished vinyl graphic after installation? You can avoid bubbles in a kit by taking your time and making sure you have a clean surface. Then you squeegee the kit starting in the middle, working slowly to one end while pressing firmly, and then doing the same with the other end of the kit. Work small sections at a time, then repeat. However you may still get small bubbles at times because of humidity or other factors. At this time you can remove the bubbles using a pin or sharp blade to make a small hole in the bubble, then working the air or water out through the hole. Some very small bubbles may disappear as the kit dries. Kits can be installed wet or dry depending on the vinyl. If its a dry install, then once the sticky side hits the surface, for the most part you will not be able to pull it back up to get bubbles out. As you get more experience at installing vinyl graphics, you may find it faster to install a kit "dry", but if you are not experienced it may be best to install kits "wet". HELP! RECEIVED WRONG VINYL COLOR, or VINYL HAS BLUE TINT? Please be assured that we do our best to have the correct VINYL COLOR shipped. We have a strict Quality Control Department that uses a 9 point inspection to check the specific information of each order before shipment. 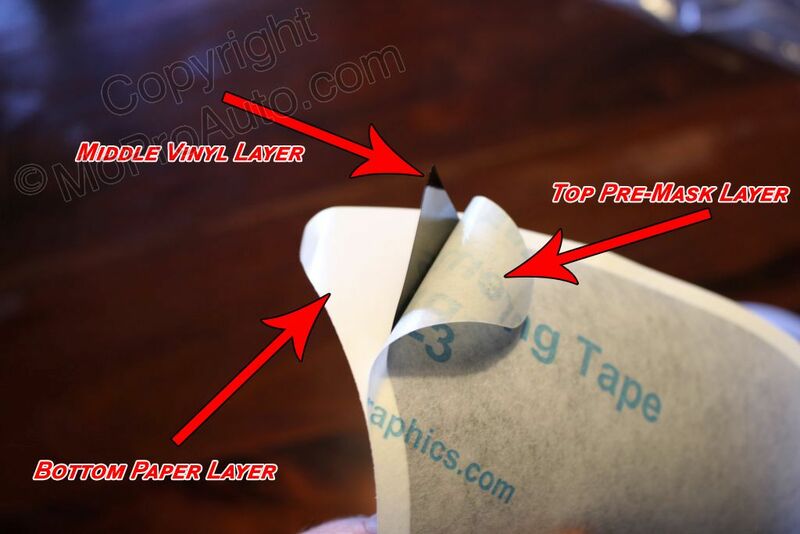 Please understand that the top layer of the vinyl graphic is not the color of the vinyl, it is the pre-mask layer that is removed on install. - 1. See the label to confirm the vinyl color you received. Let us know the written vinyl color and code # of the vinyl color that is on the shipping container and/or packing list. - 2. The "blue" top layer is the pre-mask layer used to help installation. It is the same OEM quality blue pre-mask used on OEM vinyl graphics. If you gently peel back the blue pre-mask, you will see the actual vinyl color . 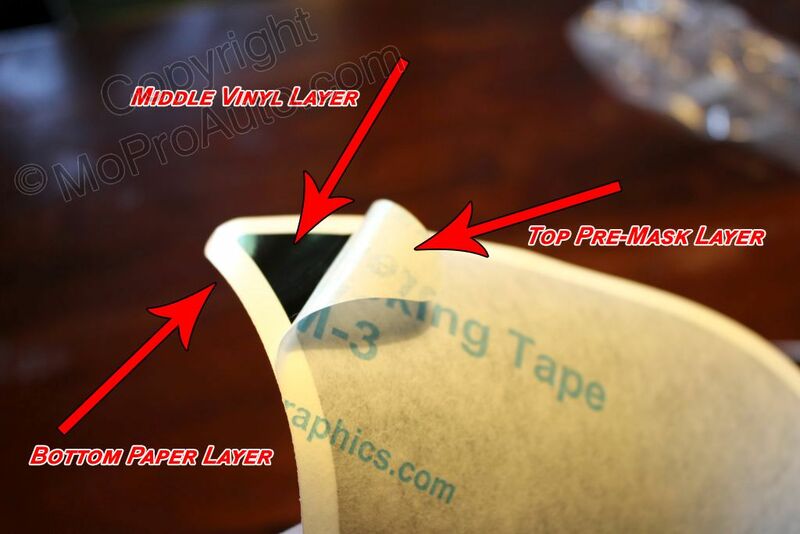 . .
TOP PRE-MASK LAYER: Most vinyl graphics have a top pre-mask layer and a bottom paper layer. The vinyl is between these two layers. 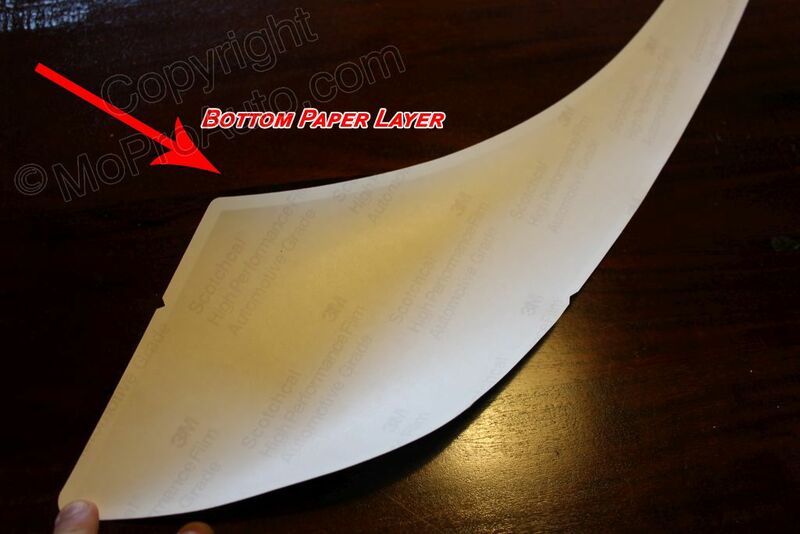 The bottom paper layer is removed exposing the “sticky” part of the vinyl. The top pre-mask layer remains until after installation and then removed. “BLUE” PRE-MASK LAYER: Some larger vinyl graphic kits (racing stripes, etc.) may come with a darker “blue” pre-mask. The "blue" is the top pre-mask layer used to help installation. 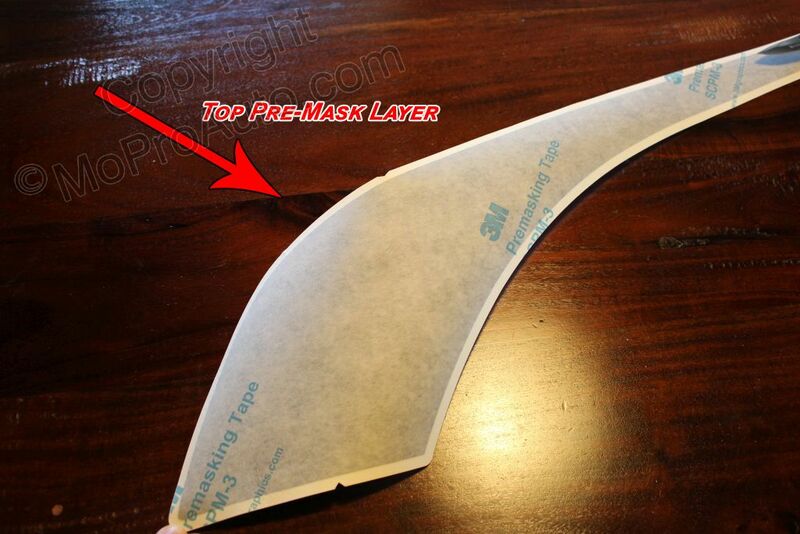 It is the same top pre-mask used on many OEM factory vinyl graphics. The top of the kit will look blue or a different color. You may see blue dots or white “spots” throughout the top pre-mask. HELP! REPLACEMENT SECTIONS of a vinyl graphic are needed! However please understand that not all vinyl graphic kits are available in seperate sections because of various production procedures. Please read the link above for more details. Can I call you with my order or pay over the phone? For the safety of our online customers private information we are only set up to take orders through our secure online ordering system, our website and/or Paypal. All major credit cards are accepted. We will not take credit card info over the phone, and do not have access to your credit card info when ordering online. This makes for a safer transaction for us both! If you would like to pay by check or money order, please email us. How quickly will the order arrive? We provide FREE SHIPPING for all items in our store, no matter the amount purchased! Most items ship within 24 - 48 business hours. Our MoProAuto Pro Design Series will normally ship within 24 hours. Some other items may be processed, packaged and shipped within 3 business days after full payment. Specialty items, custom colors, etc., may take slightly longer, so for these items please allow 10 - 20 business days to receive, although this is very rare. If there is a delay or backorder, you will be contacted. No matter the size, weight, or distance to ship to you, all rates will remain as described in each product page! Is expedited shipping (overnite, next day air, etc.) available? EXPEDITED SHIPPING : We realize many of you are installers that need an order TODAY because a vehicle graphic package is sold and a customer is in a hurry to install. Or you may be a repair shop that needs an order ASAP to finish a car. We offer expedited shipping on some of our items. If expedited shipping options are available, they will appear at checkout. We get requests for "Next Day" or "2nd Day" shipping and many times this service will cost $75 - $100+ in extra shipping charges. We go to extra lengths TO ENSURE QUALITY CONTROL of the vinyl kits we offer, and RUSHED ORDERS ARE NOT ADVISABLE! We have found that too many times rushed shipping services damage vinyl in route to the customer, which will delay the order even further. Also, most of these vinyl graphics are made on order and carefully packaged for shipping which takes time, care, and patience. So because of the custom nature of these products, please understand that you do not want to sacrifice quality over a "rush" order. "Next Day Air", "2nd Day Air", or other similiar shipping options, will arrive in the stated time after the order ships! WHY DIDN'T A "NEXT DAY AIR" ORDER ARRIVE THE NEXT DAY? Most items are custom in nature and produced when ordered. Estimated shipping times are from when the item actually ships and enters the shipping carrier system. Estimated shipping times are NOT from the moment the item was purchased. Therefore if you choose "Next Day Air", "Overnight", "2nd Day Air", or any other type of expedited shipping, your order will be put ahead of others to ship as quickly as possible, however the item will arrive in the specified time AFTER the order actually ships, not at the time of placing the order. For fastest service, we can put your order ahead of others if there is a need. Leave a note at checkout mentioning this is a "Priority Order" and we will do our best. We do offer international shipping and rates are quoted per item at checkout. The cost varies by location. Of course international shipping takes a little longer for you to recieve, so please allow 2 - 4 weeks for arrival. Once your order is staged for shipping in the warehouse, a tracking number is assigned and uplodaded into our system, and a "Shipping Confirmation" email will be sent to you with tracking information attached. However please allow 24-48 hours for the carrier to update the tracking information on their website. The tracking information says "Delivered", but I do not have the package! Please verify your current mailing address with the one entered at checkout. Please check with other members of your household to see if anyone may have put your package aside. If you live in an apartment complex or other multi-resident area, please contact your rental office to see if they are holding your package there. Some packages won’t fit in your mailbox so carriers will often leave packages at a manager’s office for safekeeping. Use the tracking number, and call the carrier direct. UPS, FEDEX, and/or USPS may have mis-delivered your package. It is possible the driver or mail carrier left the package at an incorrect address. The faster you can call, the faster carrier can pick up the package and re-deliver. If your package is still not found, please let us know and we will file a loss/theft report with UPS, FEDEX, and/or the US Postal Inspector, and other appropriate local authorities in your area. Mail theft is a Federal crime, as well as fraudulent claims for lost/stolen packages! These issues will be investigated to the fullest extent of the law. HELP! There was an error with checkout! My order was declined, however it looks like my credit card was charged! Please be assured that you were not double billed by us. If you received one or more error codes at checkout, this means the order with the error was declined and will not be processed. - You entered the wrong 3 number verification code on the back of your credit card. - Your billing street address and zip code must match the information you have on file with your credit card company. - You credit card has expired, or the wrong information was entered at checkout. 1. The card will fail the address verification system (AVS) that most merchants use to detect and prevent fraud. The order doesn't progress past our payment gateway and does not turn into a sale. 2. Your bank places a hold (or authorization) for the amount of the attempted sale. We are listed as the source of the authorization. This typically happens when using a debit card or check card and fails the AVS. 3. You wonder why you were "charged" for an order on our site that didn't complete successfully, and contact us for an explanation, and are usually upset with us over an issue that we have no control over. This is an issue that affects all online merchants who use the AVS security check system to help prevent the fraudulent use of your credit card. PLEASE double check the accuracy of your address, and if the transaction fails, DO NOT attempt again repeatedly. Each attempt will result in an additional hold. What are your Terms of Service and Return Policies? HELP! I purchased and want to CANCEL . . .
HELP! I purchased and want to RETURN . . .
HELP! I purchased and want to EXCHANGE . . .
HELP! I purchased and there is DAMAGE / DEFECT . . . Please visit the MoProAuto "Terms of Service and Policies" page *AT THIS LINK* for more details and the instructions to follow for the above situations.